Joseph Emmett Mainer (July 20, 1898 – June 12, 1971) talks about growing up, working in the cotton mills and playing with his brother Wade for the Crazy Water Crystal Company-sponsored radio shows, and recording for RCA Victor, King Records and Alan Lomax. Back in 1949 I used to listen almost every morning to XERB, a powerful Mexican radio station which at that time used to broadcast western and hillbilly music both night and day, and which covered the whole West Coast with its 50,000 watt signal from Rosarito Beach. My favorite program was a fifteen minute segment devoted to two brothers: Lloyd and Floyd Armstrong, better known as the Armstrong Twins. They picked guitar and mandolin and sang in a twangy, nasal style I had never heard before, having been in this country only two years at the time. They sang about “Three miles south of Cash in Arkansas” and “Sparkling Blue Eyes” and “Mother’s only sleeping”. The station was advertising song books, statues of Jesus Christ which glowed in the dark, pills to cure almost anything, mineral baths, doctor books, as well as other assorted strange items for which you were asked to send in various amounts to a post office box number in San Diego which must have been enormous since all products offered were to be had from this source. I never sent in for my statues but I never forgot the music I heard and when a friend of mine, Bob Pinson, just a few years ago played me some old records, I was immediately reminded of the radio programs by the Armstrong Twins. 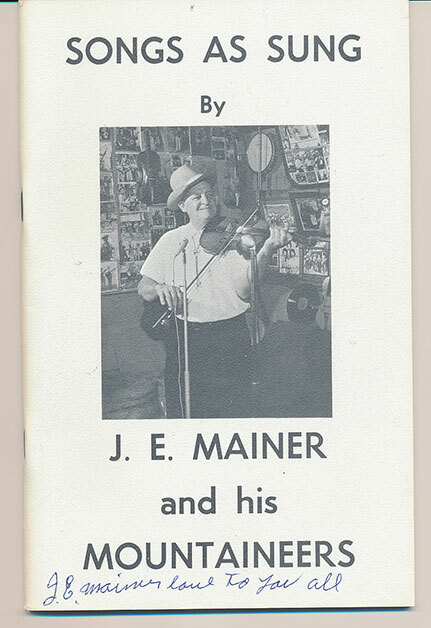 But this time they were records by none other than J. E. Mainer’s Mountaineers. I had never heard of the group before because their records were no longer available in record shops but I became very fond of their music immediately. A few years later Alan Lomax’s fine “Southern Heritage” set on the Atlantic label appeared and some of my favorite tracks were those by the Mainer band. At this time I had already started the Arhoolie label but had had few contacts with old time hillbilly artists. However, I felt I had to meet this group — they had the kind of spirit and drive I liked and their singing and playing had what I considered that real authentic hillbilly sound. On one of my southern trips, which in the fall of 1962 took me all the way to the East Coast and New York, I stopped in Concord, N. C. and hopefully looked in the telephone book – and there it was: J.E. Mainer. The next morning I met J.E. outside his house on the outskirts of town – which means out in the country, and he invited me into his tool shed where he had a phonograph, old records, song books, lots of ribbons won at various fiddle conventions, and the walls were covered with intriguing pictures of his band and other groups from the days when J.E. 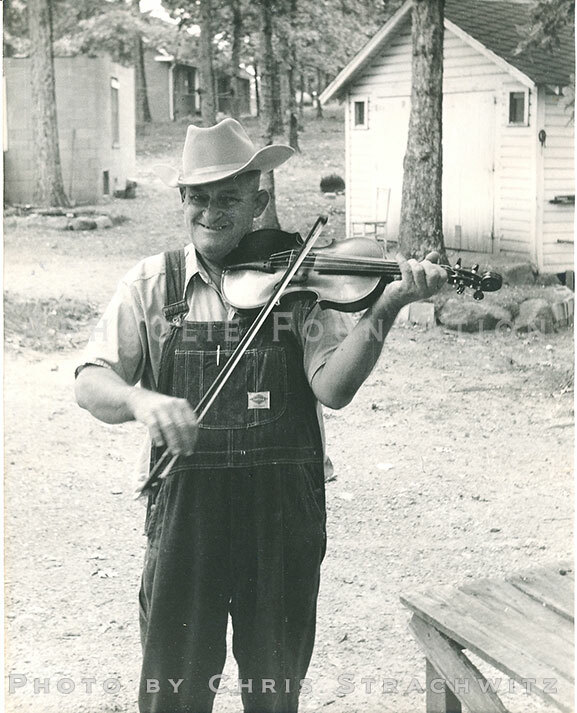 used to tour the South as one of the best loved and most popular hillbilly groups of the 1930s. But the most unforgettable item on the wall was a small snapshot of two elderly people: a man standing, his beard reaching down to his belt, and a woman seated next to him with beautiful strong facial features. Both were dressed in simple attire of the 1890s and they looked like real honest-to-goodness mountaineers. And they were: J.E.’s parents who raised him in the hills of North Carolina. Mainer’s Mountaineers were one of many groups who grew up with radio which reached into every home across the vast stretches of the USA – into the lonely prairie houses in Oklahoma – into the mountain shacks of the Ozarks and the Blue Ridge – the Smokey Mountains and the flat lands of the deep South. During the 1930s J.E. Mainer’s Mountaineers could be heard usually twice a day over many radio stations in the Carolinas, Tennessee, and Georgia where the Crazy Water Crystal Company aired a total of 147 broadcasts over 14 stations weekly, and the “Crazy Mountaineers” were no doubt one of the most popular groups to advertise the rather questionable effectiveness of these crystals. 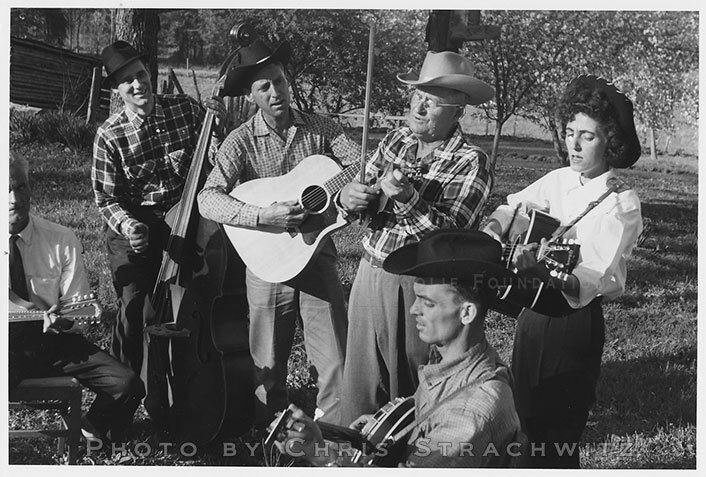 Those were the days when groups like the Carter Family, the Blue Sky Boys, the Dixon Brothers, the Light Crust Doughboys, Bob Wills, the Monroe Brothers, and many others made a good living advertising various products over the radio which led to personal appearances, recording contracts, sale of song books, and widespread fame which could not have been possible before the advent of radio. 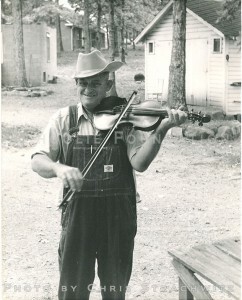 In 1923 Wade joined his brother in Concord and the two of them began playing around a bit for dances and shows. 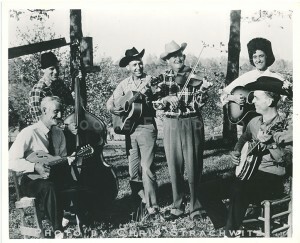 They added the singer and guitarist Daddy John Love and in 1932 came their big break when J.W. Fincher, president of the Crazy Water Crystal Co. heard about the group and sent for J.E. to come to Charlotte. J.E. and Wade were working at the Gibson cotton mill at the time and J.E. didn’t think he could leave his job because he didn’t know if they were good enough to make it on the radio, but his boss liked him and told J.E. : “J.E. you go on ahead and if you can’t make it you come back and your job will be waiting for you.” J.E. asked about Wade who was working in the cord room and the boss said: “Take him with you.” They made it all right and went to work for the Crazy Water Crystal Company. They broadcast over WBT in Charlotte and had added Claude Morris (Zeke) as the fourth member of the group. They went as far as New Orleans where they were heard twice a day over WWL and later they went to Monterrey, Mexico where they appeared on XERF at the same time the Carter Family was also working there. “All in all I have played over about 190 different radio stations throughout Virginia, the Carolinas, Georgia, Alabama, Louisiana, Texas, Illinois, Tennessee, Kentucky, Ohio, and Mexico” says J.E. with pride. RCA Victor decided to record the group in 1934 and for their Bluebird label the Mainers made close to 200 sides. Most of the recordings featured Wade and Zeke Morris. Wade had a good voice and knew the old songs. He had what can be called a “commercial” voice while J.E. was a much rougher country singer and player. 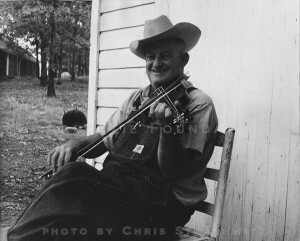 Daddy John Love would sing on the blues numbers, the yodels, and specialty selections, while J.E.’s fiddling was featured on the fast break-downs. 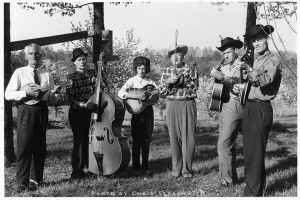 The Mainers featured many talented groups on their radio programs like the Dixon Brothers, Buck and Buddy (Robert and Morris Banks – sons of Roscoe Banks), and others who would eventually also record for Bluebird. 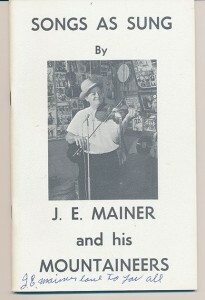 During the time of their first recording sessions their booking agent arranged for the Mainer group to play at a party given by Miss Julia Brown for her father’s birthday in Mocksville, N.C. Miss Brown was also a singer and played the guitar – she met Wade at the party and in 1937 became his wife. About this time the two brothers split up – they had their differences and decided that each should form his own group. J.E. 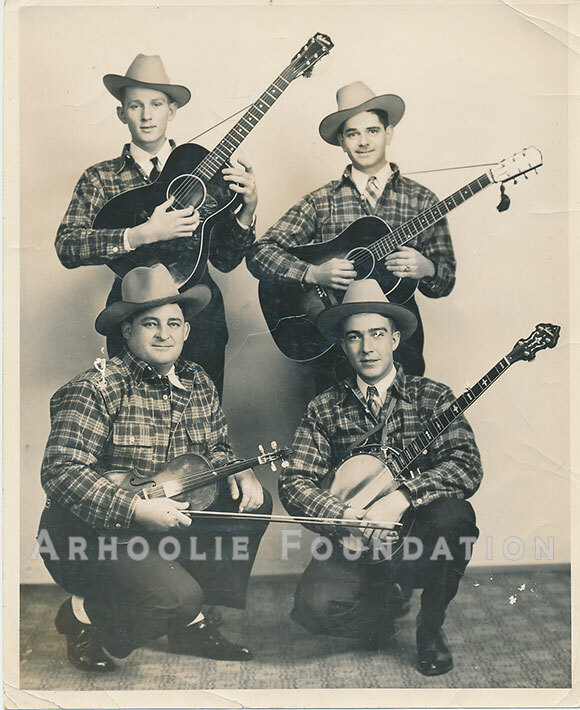 got Snuffy Jenkins in 1938 to play banjo for him, George Morris played Guitar, Leonard Stokes was on mandolin and later Price Sanders and Clyde Moody were also part of the group. The band’s personnel changed a number of times until after World War II when J.E.’s family joined him to form the present Mainer’s Mountaineers. His oldest son J.E. junior plays guitar and is a fine singer having learned most of the old songs his father and others around there were singing. Glenn – although he started on guitar, usually plays banjo and only joins the singing as the bass voice on some sacred numbers. Carolyn, now Mrs. Wilson, sings and plays guitar, while her sister Mary, who used to sing with Carolyn as the Mainer Sisters, married and moved to California. Two other sons Earl Johnson and Charles apparently never took up the musical traditions of the family. Since the war days J.E. Mainer’s Mountaineers have played over various radio stations, recorded for King, Atlantic, and Arhoolie Records. 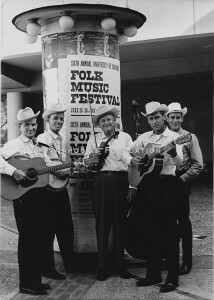 In recent years the group has played for various community-sponsored programs around Concord and in the summer of 1963 they appeared at the Berkeley Folk Music Festival. 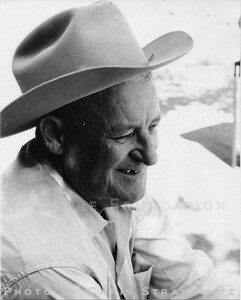 Wade went his own way, continued to record for Bluebird, and worked over various radio stations. 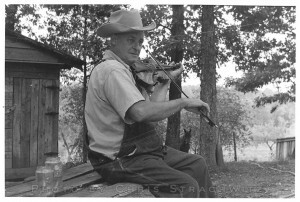 In 1941 Alan Lomax contacted him and asked Wade to appear at a folk song party for President Roosevelt and with two members of his group Wade went to Washington. He later worked over WNOX in Knoxville, Tenn. and in 1945 he went to New York to take part in the play: “The Chisholm Trail”. During the war he made some transcriptions for the BBC and after the war recorded for King Records. In 1953 Wade moved to Michigan where he is now employed by the General Motors Corp. From time to time he still sings over various stations and with his wife and children still makes music for his own enjoyment. In 1961 he again recorded for King with his wife and since then he has been mostly interested in gospel and sacred songs. In a way times haven’t changed much — only a few years ago the Armstrong Twins were carrying on a tradition that had developed with the radio and they were singing traditional songs. Similar groups can still be heard over various radio stations throughout the country and over the Mexican border stations, some of which, employing 250,000 watts of power, reach into almost every part of the US. Just drive across the country at night and you will know what I mean. But payola and pressure from Nashville is pushing aside the traditional groups — and the emphasis today is more and more on the “Top 40” in the C&W field — regional styles are disappearing but a new interest in the music is today found amongst the thousands of folk music enthusiasts and perhaps the music of the Mainers and groups like them will be with us for many years to come. 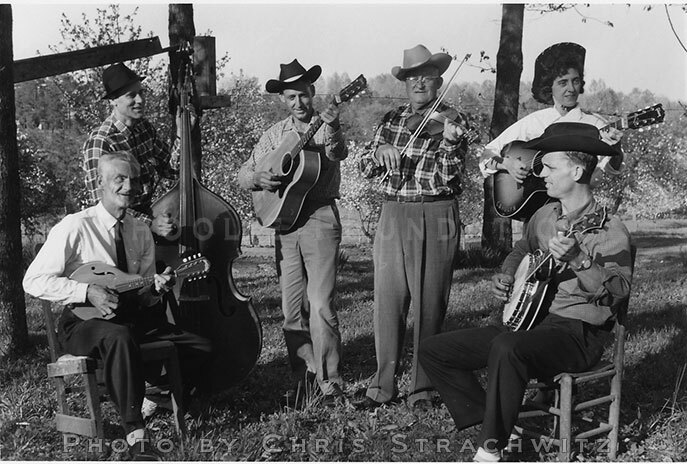 Perhaps the Mainer groups did not contribute as much to American Folk Music as the Carter Family or Bill Monroe but they were perhaps the most typical of the many groups which at that time were playing all over the South. They sang and played old songs and some new ones — songs the people wanted to hear — in their own way — but in a style handed down to them through the generations — and of course with a good deal of desire to imitate their popular contemporaries.